While most of us are familiar with the concept of acupuncture, the term “acupressure” is often met with a little confusion. Is it simply a special type of acupuncture? Well, no – but they are closely related. Acupressure and acupuncture both have their roots in ancient traditional Chinese medicine. They apply the same principles in order to promote relaxation and wellness as well as to treat ailments and symptoms ranging from headaches and menstrual cramps to nausea and mood issues. But how is acupressure performed and how does it work? When an individual receives acupressure treatment, pressure is applied to certain points along the body known as ‘acupressure points.’ These acupressure points can be in the same general location as the ailment or pain being experienced. More often than not, they are considerably removed (we’ll look at some specific ones later in this article). Pressure is applied (either self-applied or by an acupuncturist or another trained individual) using the hands, elbows, feet or specialized instruments. Usually, pressure will gently but firmly be increased to a maximum within about 30 seconds. This pressure is held for the same amount of time, and then gradually decreased for a final 30-second period. Deep breathing is usual encouraged throughout the process. This will be repeated a number of times before moving on to another acupressure point. A session can last anywhere from 45 to 90 minutes and will often be combined with some other sort of bodywork, especially massage techniques. Acupressure and similar techniques have been practiced for over 5,000 years – however, science is only just beginning to fully investigate and understand how these long-standing techniques work. The ancient Chinese believed that energy flowed along subtle energy pathways known as ‘meridians’, which connect our organs with other parts of our body. They hypothesized that when there are blockages of energy in these meridians, we experience illnesses. Techniques such as acupuncture and acupressure clear these blockages. With our modern understanding of the human body, it is now known that addressing acupoints stimulates the release of endorphins – natural chemicals that promote pain-relief and healing. It is also suspected that acupressure and acupuncture, when properly performed, can positively influence the autonomic nervous system. Optimizing the operation of this system and the processes it controls will naturally have a positive effect on overall health. There are many other applications people have used acupressure and acupuncture for throughout the past several thousand years. However, these have not all been researched and the treatment’s efficacy here is unknown. Other possible benefits include using acupressure as a beauty treatment by improving muscle tone and circulation, as a long-term aphrodisiac (increasing general arousal), and as a treatment for sexual dysfunction and infertility. It may surprise you to find out there are hundreds of acupoints throughout the human body – more than 400 have been described! Most often found at indentations and depressions of our anatomy, these points can be said to favor acupressure over acupuncture in a particular way. Acupuncture requires pin-point accuracy, while acupressure and related techniques such as auriculotherapy (ear acupressure) require a more general placement. This may well be the most well-known and revered of all acupoints. The pericardium is the protective sac in which our hearts sit. This particular acupoint is located on the inner forearm. If you measure three finger-widths up the forearm from where the hand meets the wrist, the PC-6 point is in between the two prominent tendons. It is used for the relief of nausea, motion sickness, headaches, and carpal tunnel syndrome. Another well known and often used acupoint, this is associated with the liver. It is located on the top of the foot. To find it, begin at the webbing between your big toe and the toe adjacent to it. Sliding your finger or instrument up half an inch, you will find an indentation – this is where the LV-3 acupoint can be found. Believed to be the number one stress-relieving acupoint, you can achieve the best results if you manipulate the LV-3 point on both feet simultaneously. Many practitioners consider the LI-4 as the third in the body’s top 3 acupoints. It is actually an area we are very familiar with and is quite easy to find. Laying your hand flat on a surface, palm down, simply press your thumb up towards the rest of the hand. A fleshy mound will rise next to the crevice between the thumb and the edge of your hand. This is the LI-4 acupoint. To manipulate it, simply relax your hand and apply pressure using your other thumb. This point is said to aid in headache relief, healthy bowel function and muscle relaxation. This acupoint is considered important because it is where the three meridians in the leg meet. It is located on the inner leg. When attempting to locate it, begin at the center of your anklebone. From there, move up the leg four finger-widths. Move your finger or instrument towards the rear of your leg and the point will be just off the tibia bone. While many acupoints have seemingly abstract, mystical names, this one (Pool at The Crook) is quite helpful in locating it as it is found right at the crook of the elbow. Professionals suggest the following technique – hold your arm at 90 degrees, perpendicular to the direction you are facing – much like it was in a sling. Turn your palm upwards, and then with your other hand, apply pressure at the outside of the elbow crease. In addition to relieving arm, elbow and shoulder pain, this acupoint is said to promote the healthy operation of the digestive tract. This acupoint is considered one of the most effective in the treatment of lung related issues. It is located just below the collarbones, approximately three finger-widths away from the meeting place of the arm and the shoulder. It is used to treat coughing, wheezing, asthma, and other such lung-related issues, as well as problems with ingestion and pain in nearby regions such as the chest, shoulder, and back. This acupoint will be familiar to anyone who has had a massage to treat certain types of head or sinus pain. To locate it, place each of your thumbs on the bony base of your skull behind your ears, around the hairline. Slide them inwards. Midway between the ear and the spine, you will feel the point where two muscles join where the neck meets the skull. This point can relieve painful conditions such as migraines, sinus/colds and associated pain, and general stiffness of the neck. Sinus congestion and the fluid buildups that can cause it are known to result in anything from great discomfort to almost unbearable pain. For many, these can be chronic conditions that are resistant to treatment. Some sufferers have found this acupoint to be a godsend. To locate it, professionals suggest gripping your leg around the midpoint of the shin, with your thumb at the back. Pressing into the tibia, move your thumb just off the bone to the outside of the leg. Pressing here will put you in contact with this acupoint. In mystical terms, this point is believed to soothe and nourish the Spirit. The actual results said to be achieved are in line with this – HT-7 is used to relieve anxiety and is said to have calming properties that assist in relieving insomnia. It is located directly on the wrist. To locate it, place your arm palm side up and observe the wrist creases or wrinkles where the arm meets the hand. The point where the wrist crease meets the perpendicular line drawn from your pinky finger will be the HT-7 acupressure point. The beginning point of the kidney meridian is strongly associated with energy levels, general health, and creating balance. It is found at the bottom of your foot. Starting at the toe end, it is about a third of the way down the main part of your foot, in line with the second toe (the one adjacent to the big toe). It is said to help treat anxiety and other mood disorders as well as help improve memory. Another kidney meridian point, this one is even more related to creating balance and replenishing energy in the body and is often used to treat issues associated with aging. Arthritis, dementia, incontinence, hair loss, and lower back and knee issues are all targeted along with pain conditions such as a sore throat and toothaches. It is also located in the foot area. To locate it, place your thumb on the inside anklebone then move it towards the Achilles’ tendon until you reach the sunken area between the bone and tendon. Those with good memories (perhaps recipients of regular KD-1 acupressure!) will recall that the Governing Vessel is the meridian that runs along the length of the spine. This acupoint is located at the top of the head on its center line (front to back) on the perpendicular line drawn between the tops of the ears. A point that relates to areas in close proximity, it is used in the treatment of headaches, vertigo, ear/nose/throat issues, and mental disorders. Another respected acupoint, this relates to the bladder meridian, which is the longest in the body. As a result, points along this channel treat a myriad of issues. This particular one is used to treat some expected ailments such as bladder infection and knee pain (as it is located in this area). However, it is also used in relation to headaches, sore throats, toothaches, and back, foot, abdominal and hip pain. This is one of the easier points to locate – it is simply at the back of the knee. This acupoint (along with others) was shown to activate cerebral functions in certain areas of the brain. Innumerable people rely on acupressure to relieve everyday pain, chronic issues or simply maintain good health. There is a particular type of acupressure, however, that many find particularly effective – auriculotherapy or ‘ear acupressure’. 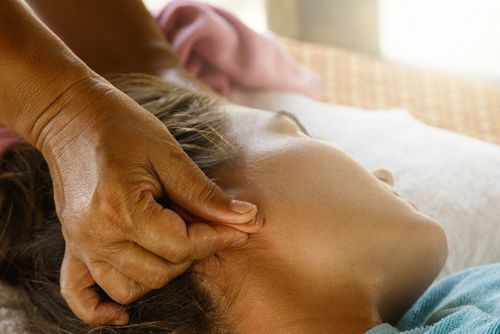 Referred to by some as ‘ear reflexology’, this method works on the hypothesis that there are hundreds of points in the ear that act as a microcosm for the entire body. Acupuncture and acupressure are both used to take advantage of this concept, but a non-invasive and easy-to-self-administer method is revolutionizing the field. Ear seeds, consisting of either seeds from the vaccaria plant or small metal pellets, are secured to the ear using an adhesive on specific acupoints. Continuous pressure combined with occasional manual stimulation allows you to get the benefits of auriculotherapy without repeated expensive visits to an acupuncturist. To learn more about this technique embraced by Matt Damon, Gwyneth Paltrow and Penelope Cruz, contact us today!